It was 4/11/2011 I was in Canyon Lake, Texas and it was my fifth month of trying to figure out what road I was suppose to be on after making a few wrong turns. It had been so dark on the road and I found myself lost, alone and very weary. There were moments that there were lights that shined bright enough to see down the road a little ways and this was one of those days where I could see the road ahead. I was sitting outside and for the first time in a long time I could write again in a journal. It was page after page about Hope. It was truth, it was prophetic and I was very excited to write words again that were not filled with tears but filled with Hope. As I wrote page after page on Hope and what Hope means I got to one page and I have no idea but I wrote the words “Hope Deferred”. I wrote nothing else on that page flipped the page and kept writing. I had no idea what that meant or why I wrote it. This time in my life was the worst and the best time all combined into one. I was basically homeless and 42 years old and right where God would have me be because He was about to give me a gift and lessons that you can only receive on the wrong road. Lose all hope and at the same time I fought as hard as I could to keep hope. I was desperate to get in my feet and desperate to not give up my life and not end it. I was so broken and only Jesus could put me back together again, trust me I worked many years trying to repair the damage done to me and by me, now with out total dependance on God I would surely die. So a month later I am cat sitting for friends in Austin and I am spending most of my time for 10 days creating a scrapbook for my daughter for her graduation because I have little money, but I still have scrapbooking stuff and I could give her what I have to give at the moment. (This still makes me cry so hard, the greatest time in her life and I am broken and broke) Back to the story… I was alone with my friends cats, creating a scrapbook, talking on Facebook and alone. I felt like I wanted to go to church and I found one near and I went. Pulled up filled with anxiety and I walked up to the door and turned around went down the stairs and headed back towards the car, then wrestled with myself and the Holy Spirit about walking into a small church and having to talk to people. Anyway the Holy Spirit won! I went in and the pastor started preaching and I felt like I was on a Touched by an Angel episode and Roma Downy was about to walk up with Tess. 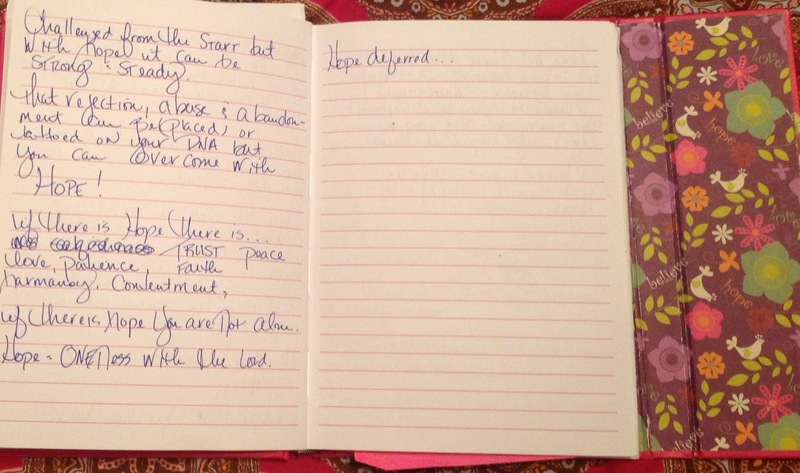 The Pastor said the word Hope Deferred and began speaking my word that just a month earlier I left blank in my journal. I had the journal with me so I wrote in the back the date 5/22/2011 I jotted my notes, wrote the story to my Facebook friends like I always did and still do and went on with my journey. It was not until yesterday morning when I was in my quiet time preparing to do my next Art bible Journal page thar God placed on my heart Hope Defereed. 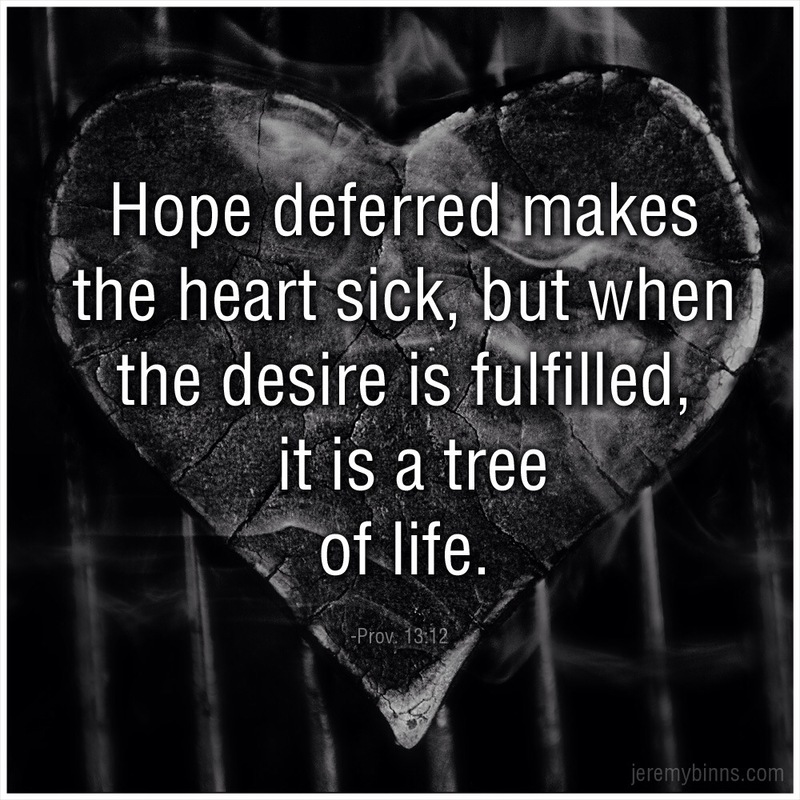 I just wanted to tell this little story and say that if your needed a good word on Hope and how not to lose Hope it’s on it’s way and I am truly excited to actually be sitting at Jesus feet, listening, writing and creating in order to share a message of Hope. Hope does not come easy sometimes you just have to really look hard to find it …..
It’s there if you seek I promise you that !!!! I love this story, and how God is always waiting to reach down and pull us out of whatever mess we have made. I am thankful for the hope He has given me after living the biggest part of my life not having any hope or peace. Thanks for your transparency and tour heart.